Homemade Chocolate Fondue Recipe | Easy Chocolate Dessert Idea! Quick and easy chocolate fondue made with 4 ingredients. You don’t even need a fondue pot to make it! Perfect as a dip for berries, cookies, and more. 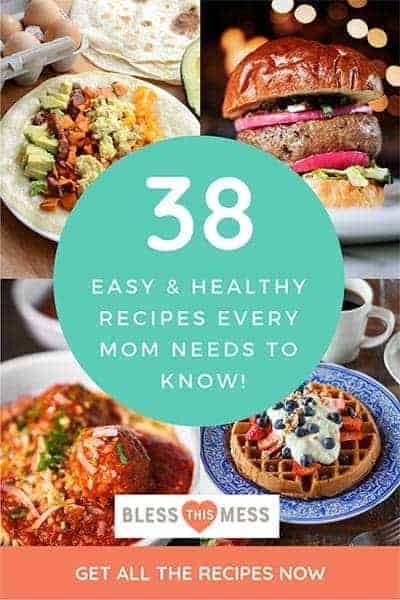 I’ve been looking forward to posting this recipe since I made it! Didn’t the pictures just turn out perfect?! 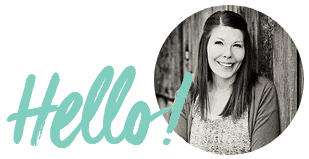 This post was originally published in 2010 and updating it has been so much fun. I’ve been planning on putting it out for Valentine’s just for you! Chocolate fondue is super simple to make (and you don’t even need a fondue pot to serve it in really, though you sure can if you have one). Taking turns dipping all kind of goodies in chocolate is just fun. When I served this to a crowd, I pre-filled 2 ounce serving cups for the kids with chocolate so it was easy for them to grab and go. After the kids filled up their plates, we took the whole board to the table and the adults just sat around munching and talking. The perfect end to an evening. This would be such a fun dessert to make for a party, a family date night, or to celebrate something special like Valentine’s Day. I hope you find a reason to make it for your family soon. You don’t notice the peanut butter in the chocolate when you add just 2 tablespoons. It adds a nice texture and depth of flavor, though. If you want a hint of peanut butter with your chocolate add the full 4 tablespoons. 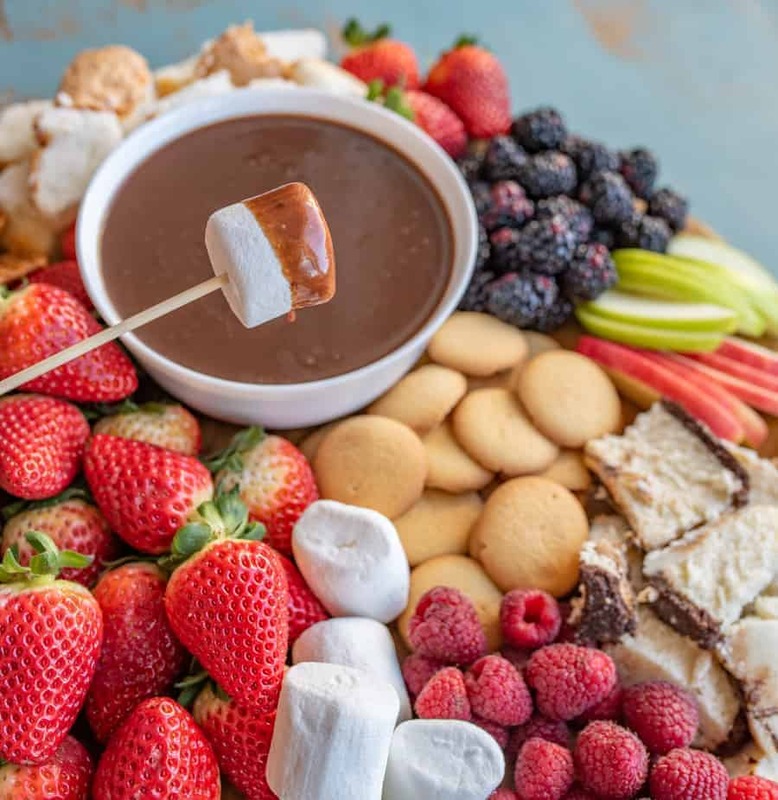 If you don’t have a fondue pot: you can simply pour the chocolate fondue in a bowl and use large wooden skewers (like you would make grilled kabobs with) to dip with. 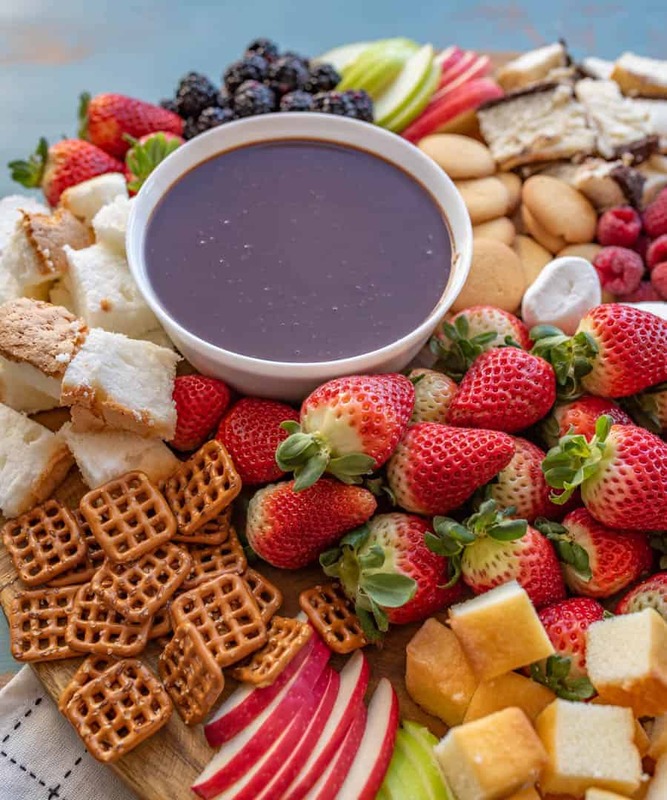 The chocolate fondue will stay warm and dip-able without a fondue pot for about 40 minutes. If you like a semi-sweet fondue, use semi-sweet chocolate chips. If you like a sweeter chocolate fondue, use milk chocolate chips. Good quality chocolate chips make a big difference when it comes to the end product. I like Ghirardelli chips for this recipe. Cheap chocolate doesn’t melt well and and can have a funny taste when heated. If I ever buy a fondue pot, I’m getting this enameled cast iron one. How gorgeous is that? 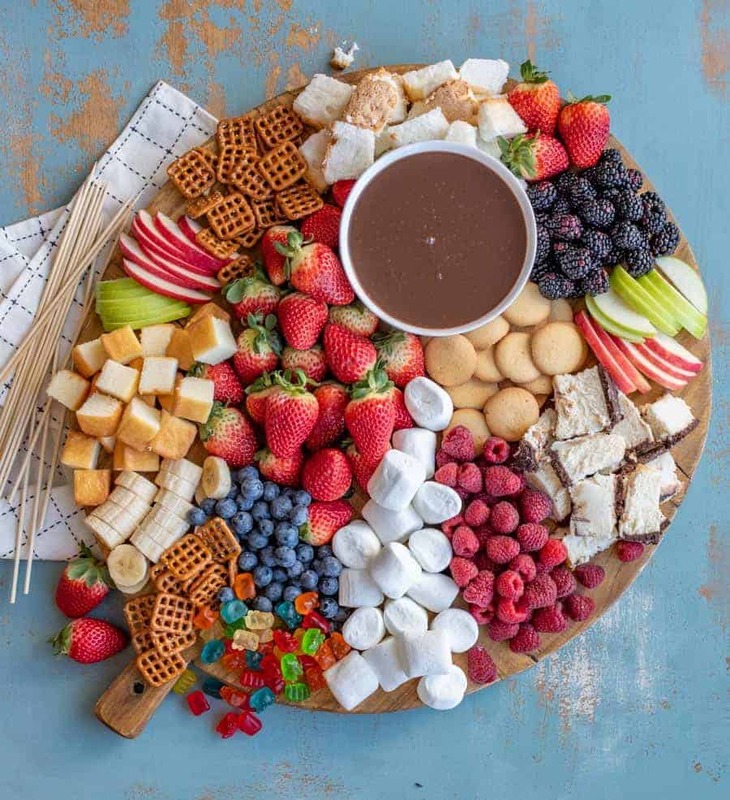 What do you serve with chocolate fondue? anything else that you think tastes good with chocolate! Quick and easy chocolate fondue made with 4 ingredients. You don’t even need a fondue pot to make it! Perfect a a dip for berries, cookies, and more. 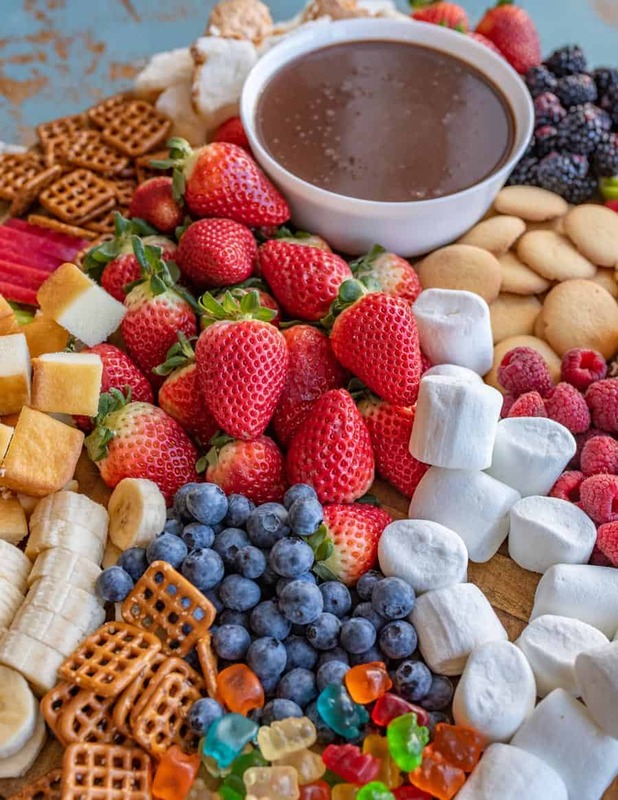 Things for dipping in your chocolate fondue such as: strawberries, blueberries, raspberries, banana slices, apple slices, vanilla wafers, frozen cheesecake chunks, gummy bears, pound cake, graham crackers, angel food cake, pretzels etc. In a medium sauce pan, over medium heat, heat the cream until you just start to see steam coming off the top. Remove from the heat and add the chocolate all at once. Let the mixture rest for 1 minute. Add the peanut butter and stir to combine. Transfer it to your prepared fondue pot and enjoy dipping in things. If you do not have a fondue pot, you can simply pour the chocolate fondue in a bowl and use large wooden skewers (like you would make grilled kabobs with) to dip with. 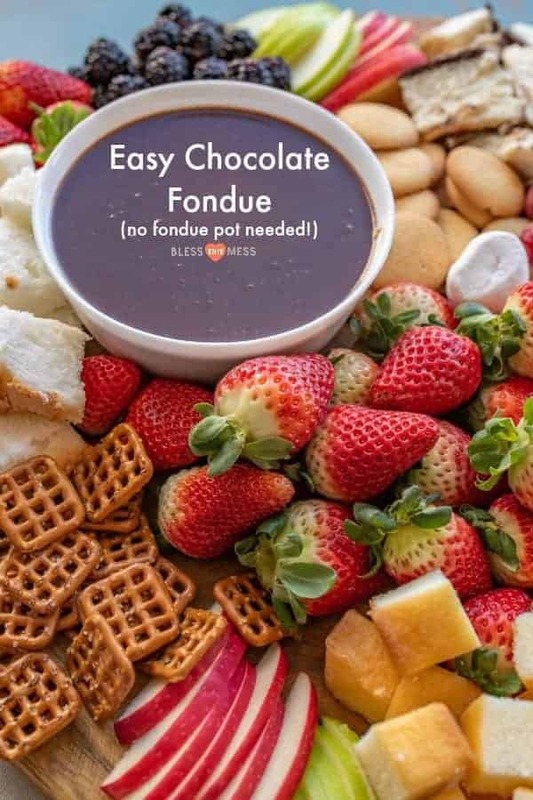 The chocolate fondue will stay warm and dip-able without a fondue pot for about 40 minutes. You don’t notice the peanut butter in the chocolate when you add just 2 tablespoons. It adds a nice texture and depth of flavor, though. If you want a hint of peanut butter with your chocolate, add the full 4 tablespoons. If you like a semi-sweet fondue, use semi-sweet chocolate chips. If you like a sweeter chocolate fondue, use milk chocolate chips. Good quality chocolate chips make a big difference when it comes to the end product. I like Ghirardelli chips for this recipe. This makes a fairly thin fondue. If you’d like it to be a bit thicker, reduce the cream to 1 and 1/4 cups. How pretty is that you guys? Enjoy making it as much as you do eating it, because making a big platter like this is a whole lot of fun. Over the years, I’ve been intentional about adding new chicks to my flock of backyard chickens that lay different colored eggs. When you go out to gather eggs, it’s like picking a bouquet! I currently have white, light brown, medium brown, blue, light green, and camo green eggs. Now I just need some really really dark brown eggs and some with speckles. 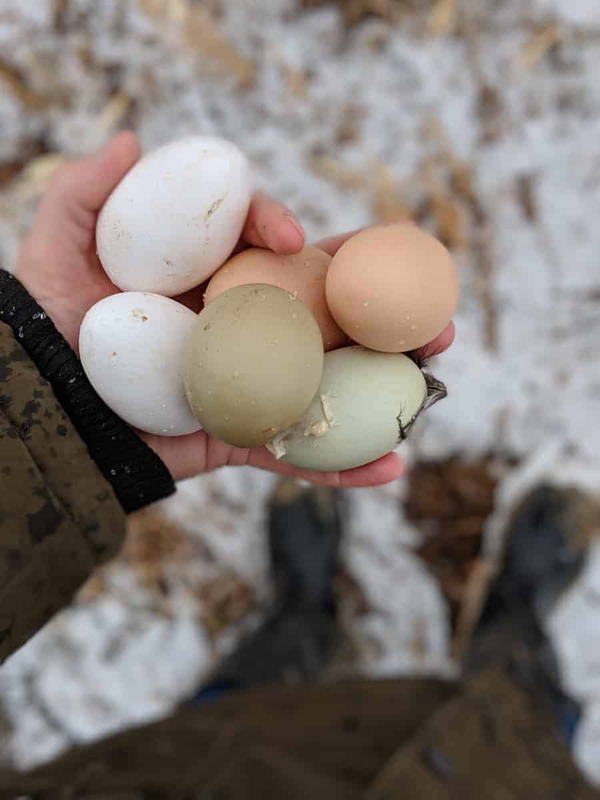 The color of the egg is determined by the breed of the chicken so having a large variety of chicken breeds means you get a large assortment of eggs to collect. Pretty, aren’t they?